A new digital campaign launched for World Environment Day is hoping to ring alarm bells on the catastrophic effect of climate change. Created by BBDO and Proximity Singapore and CarbonStory, a crowd funding platform for climate change projects, the campaign runs on the slogan, ‘Raise your voice, not the sea levels’ and hopes to get people to reduce their carbon footprint. A microsite has been created to show viewers the catastrophic impact of global warming and melting ice caps in their own neighbourhoods. 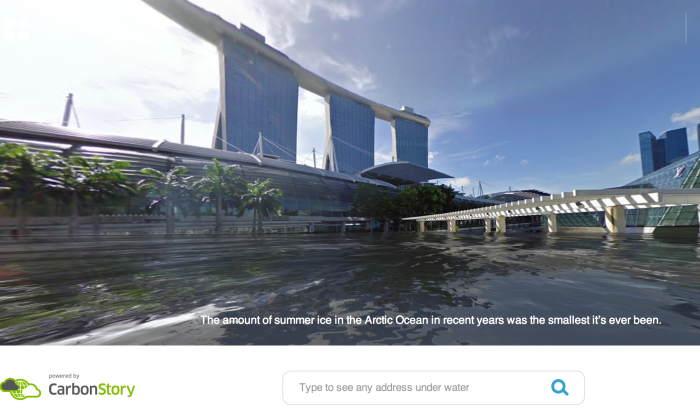 Users can choose any location in the world on Google Street View and see what it will look like after sea levels have risen. They can then share their Street View under water on Facebook and Twitter. “Over the years there has been a lot of talk about climate change but sadly not enough action. The World Under Water Campaign has been designed not just to increase awareness about climate change but also to give people a platform to take action to create a better future”, Andreas Birnik, co-founder of CarbonStory said. “If you strip away all the geekiness, this is an emotionally engaging consumer experience that we hope will change behaviors”, Ronald Ng, chief creative officer of BBDO and Proximity Singapore added. The appointment, which is effective as of 1st June 2017, will see him lead Publicis One in a dual capacity as CEO as well as his c..